Singer-songwriter, hip-hop artist and peace activist Michael Franti is usually right at home on festival stages, having performed at virtually every major American festival from Bonnaroo to Coachella. But he felt especially at home at the inaugural Echo Project, an event that combines a loaded line-up with environmental awareness and education. "When I think of an echo," Franti told the audience, "I think of a drop of water falling into a pond. The waves ripple outwards." Tapping into Bob Marley's canon for the one-two punch of 'Get Up Stand Up' and 'Stir It Up,' Franti encouraged the audience to pick up their trash, vote in the upcoming election and to be vocal about "bringing the troops home." And all without forgetting that things like dancing around and getting stoned at a festival can be important things in life, too. Hours later, after checking out the Roots from the side of the stage, Franti proudly told Spinner that his tour bus now runs on bio-diesel. Discussing the obstacles that have come from driving across the country using an alternative-fuel source, Franti commented that a friend of his just got a vehicle that actually uses propane. In addition to being headier than gasoline, Franti said, "it runs on pennies." 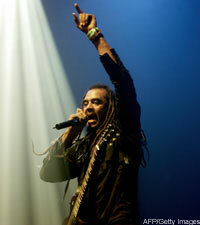 Meanwhile, Anti-Records just released a new live CD from Franti and Spearhead, entitled 'Yell Fire! LIVE' -- available now at retail for about the cost of a road trip in a propane car.